Although you need to be fully prepared for a hike in spring, summer, and fall, winter hiking is a completely different story. A winter hike requires a lot of extra clothes and gear, and if you're not 100% sure of what to get, you'll quickly find yourself with overly expensive merchandise and an empty wallet. Don't go bankrupt by purchasing the best-looking thing in a sporting goods store. Instead, read our breakdown of different types of winter clothes and gear so you'll know what to look for next time. 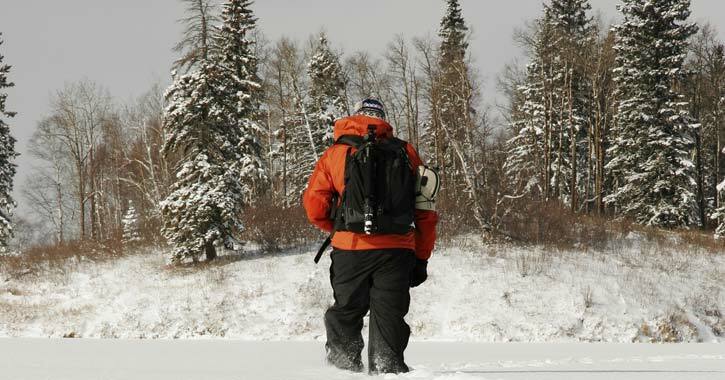 Learning how to dress for a winter hike is essential if you want to stay warm and protected from the snowy conditions. To help you know what to look for, we've broken down different layers and types of winter clothing. As the name suggests, base layers should be the first layer of clothing you have on when dressing for the winter weather. For a winter hike, you'll want a long-sleeve top and a full-length bottom. A base layer should be made out of a moisture-wicking material so sweat is drawn away from the body and into the middle and outer layers. The fabric should be fairly snug against your body. When looking for base layers, avoid cotton clothing. Cotton is not a moisture-wicking material and won't help at all in cold temperatures. Instead, search for base layers made of synthetic material (nylon, polyester, or a polyester blend), wool (traditional or merino), and silk (usually treated to enhance moisture-wicking properties). The middle layer should provide additional insulation and be worn over the base layer. The most popular type of middle layer is a fleece jacket that is made out of polyester. It should be soft, lightweight, and breathable. The outer layer is your first defense against the cold winter conditions. The recommended outer layer is a windproof and waterproof coat/jacket, preferably with a hood. Look for an outer layer with a polyester lining and a nylon shell for maximum protection. When searching for snow pants, you'll want to find a pair that is insulated and waterproof. The recommended materials are polyester, nylon, or a combination of both. Some brands may have a unique name for their fabric, so you should research what the material is actually made of. From mittens to leather gloves, there are quite a few options available to choose from for winter. However, if you're planning on spending a lot of time outdoors, you'll want a pair of warm and protective winter gloves. Some features to look for include a nylon outer shell and a polyester lining. You want your gloves to be waterproof, windproof, moisture-wicking, and insulated. Finding the right pair of winter boots/hiking boots is a little more difficult than picking out other clothing products. You want the boots to fit properly, feel comfortable, and have insulating and waterproofing properties. Some recommended materials include a rubber sole and a waterproof membrane/mesh lining. You can also purchase gaiters to help keep the snow out of your boots. You can't go wrong with a wool hat, but there are other options as well. A synthetic (fleece or acrylic) hat dries faster, but you may feel the wind. If you can find a hybrid, then you'll have different forms of protection. Since a hat only covers down to your ears, a wool balaclava is helpful in covering your face and neck as well. When you go shopping for winter socks, look for words like wool, merino wool, synthetic insulating, and synthetic wicking. These materials will give your socks moisture-wicking properties and keep your feet warm. For extra protection, silk sock liners are moisture-wicking as well. If you've gone winter clothes shopping before, then you've probably seen the name GORE-TEX™. But what is GORE-TEX™? The GORE-TEX™ product is in a wide variety of winter clothing, and the membrane is made out of a waterproof, windproof, and breathable material: polytetrafluoroethylene. Don't know what crampons or bivvys are? Don't worry! We've picked out some common pieces of winter hiking gear and highlighted the main features of each. 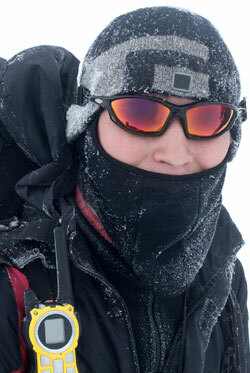 A handheld GPS is expensive, but it can be a lifesaver for the inexperienced. When you are hiking and there is no cell service, a handheld GPS will work via satellite, allowing you to determine your general location. The GPS devices that cost the most have more features, such as text messaging and route sharing. Others are cheaper, but they may lack features you would want. Compare devices and find one that would work best for you. For a winter hike, you will probably need something bigger than your average high school backpack. Take a look at different hiking backpacks, read about their features, and try them on if you can. Remember, you'll want one large enough to hold extra clothing and essential gear. Some hiking backpacks have straps for ice tools and even snowshoes/cross-country skis. Before you buy a hiking backpack to test at home, check to see if you can return it if necessary. Dry sacks are what they sound like, a sack that keeps your goods dry. Once filled with clothes and other items, you can put them inside your backpack for safe storage. These sacks are made of nylon with a polyurethane coating that waterproofs it. They are relatively inexpensive, but if you want to store electronics in a dry sack, it's recommended to use two. For maximum protection, a waterproof hard case is your best bet. If you are forced to spend the night outdoors during a winter hike, an emergency bivvy can save your life. A bivvy is a small and lightweight shelter that you can go inside of, similar to a sleeping bag. Your bivvy should be made out of tear-resistant polyethylene or another material that will keep you warm and dry in cold conditions. The bivvy should also be a bright color so rescuers can spot you. To prevent your bottles of water from freezing in extremely cold temperatures, a water bottle sleeve/carrier is the answer. These are commonly made out of neoprene or a thick, stretchy nylon material (similar to a wetsuit). Find one that fits the size of your water bottle. Crampons are basically attachable cleats for your winter boots. Each crampon has multiple stainless steel spikes that provide traction on slippery surfaces. Crampons come in a few different sizes, and to attach them, you have to pull each crampon around your boot. A quality ice axe will have a stainless steel head that is curved, which allows it to dig into the ice. They are helpful when ice climbing, ascending a steep slope, or if you have to slide down an icy hill. When you stand with your arms at your side, the spike of the axe should barely touch the ground. Be sure to learn how to properly fasten an ice axe to your pack.